From now on when I hear classy, elegant, or black tie, Matt and Michelle's gorgeous outdoor wedding will forever come to mind. 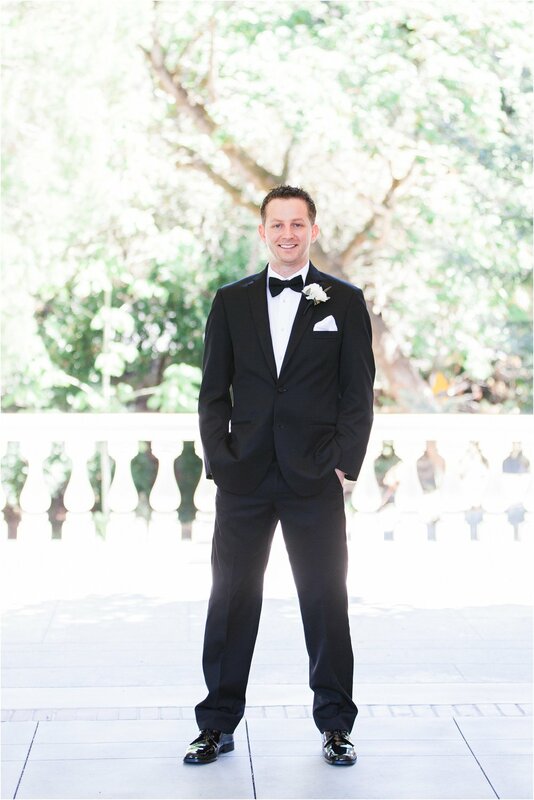 Their sun drenched wedding was held at the lovely Villa Montalvo in Saratoga during the fourth of July weekend. It was truly a photographer's dream come true! At every turn there was a jaw dropping photo opportunity. From the breathtaking gate leading into a long cypress tree walkway, guided by roses on each side, to the massive lawn with a view of the villa from afar. The venue, decor, and summer sun perfectly resembled the unique and strong love that these two have for each other. The bridesmaids wore stunning, full length, black dresses keeping and the couple's black and white checkered cake added that pop of fun. Toasts were made, and dinner was shared, over looking the lawn on a perfect summers night, with the villa's front steps calling you to come sit and relax. The evening ended with the hora, as Matt and Michelle nearly fell out of their chairs in laughter. Classy and fun is what Matt and Michelle are all about and it showed! Congratulations to the lovely couple!